My rating: 8/10. 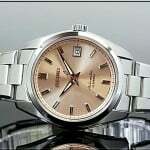 Men’s oversized automatic watch. Today we’re going to be taking a look at a mid-range timepiece from TW Steel. This is a high-quality timepiece running on an automatic Seiko NH35 movement. 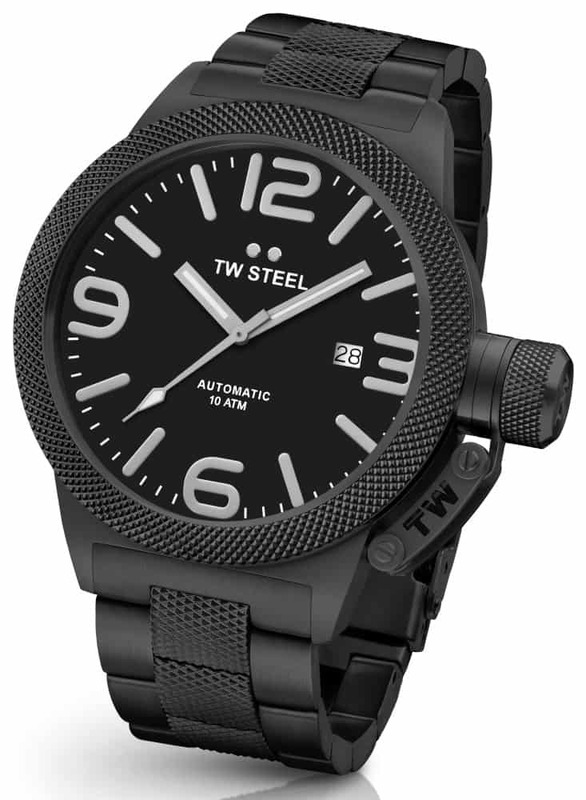 A key feature of this TW Steel watch is the oversized design with its impressive 50mm diameter casing. I hope you enjoy today’s TW Steel CB216 watch review. Below is an image of the TW Steel CB216. As always I wanted to get things started by taking a look at the overall specifications for today’s watch. This usually gives people a chance to glance over some of the more important aspects of the watch they’re considering. The dial of this TW Steel timepiece features a bold easy to read design with large numbers and hour markers that stand out against the black background. The hands have a larger width with a coating of lume for better visibility in dim lit conditions also. One of my favourite parts of this watch has to be the textured hammered finish to the bezel that they’ve also used on the crown and part of the stainless steel strap. I mentioned earlier on that this is an oversized men’s watch, the stainless steel PVD black coated casing actually measures an impressive 50mm in diameter, that’s huge. Keep in mind that at this size, this watch isn’t suitable for people with smaller wrists. If you’re after something that will stand out and get noticed on your wrist though, this is just the ticket. The thickness of this watch comes in at approximately 15mm making it quite chunky also. Some of you may not realise that this TW Steel watch actually as an exhibition style caseback. This is a glass window on the rear of the watch that allows you to see the automatic NH35 Seiko movement working away. Personally, I’m a big fan of this feature and love to see it on automatic watches. 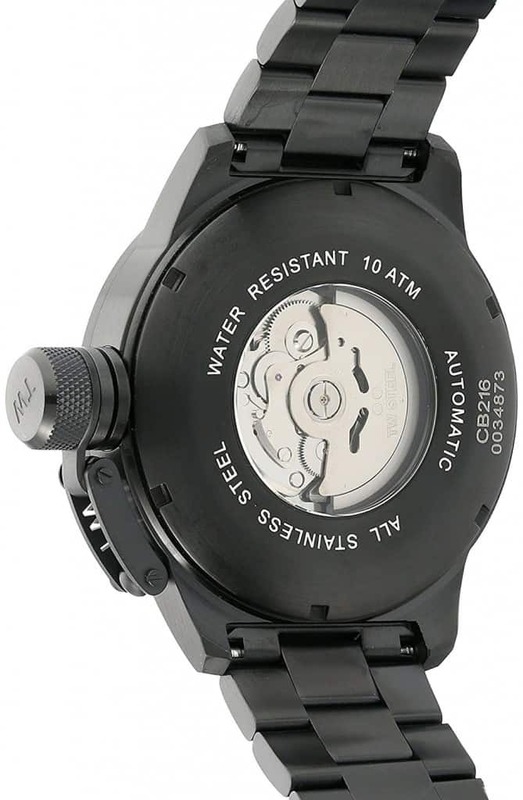 Just like the casing, the strap itself is made of stainless steel with a PVD black coating on it, it features the same style of hammered finish on the mid-pieces as it has on the bezel and crown. The strap measures 24mm in width, this is slightly wider than traditional ones but it makes sense considering the nature of the larger casing. It fastens with a simple fold-over clasp that comes with a safety catch. At the heart of this massive TW Steel timepiece is a Seiko built NH35 automatic movement. You’ll find this movement in a whole range of watches, I happen to quite like it, it’s a high-quality movement with very good reliability and timekeeping.As I mentioned earlier on, you can actually see this movement through the exhibition caseback on the rear of the watch. 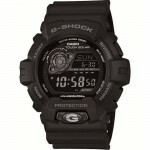 Protecting the dial of this watch is a mineral crystal glass lens that’s been hardened with a layer of sapphire crystal. This is the best of both worlds, mineral crystal glass provides a very good level of shatter resistance whereas the sapphire layer provides you with better scratch protection than mineral glass on its own would. Overal I’m pretty pleased with this choice within this price range. 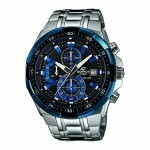 The water resistance rating of the TW Steel CB216 is 100m, also known as 10 bar. A water resistance rating of 100m (as per Wikipedia) is suitable for recreational surfing, swimming, snorkeling, sailing and water sports. I wanted to point out some of the pros and cons of this TW Steel watch and display them in a nice and easy to read format so you can see if this watch is right for you. If you love big watches then I really recommend checking this timepiece out. You don’t see too many timepieces go to the excessive size of 50mm with their casings. This will definitely stand out and get noticed on your wrist. The watch is built with quality materials also. There’s the high-grade 316L stainless steel and the sapphire topped crystal glass lens, and let’s not forget about that NH35 Seiko automatic movement. Having taken a look at the quality, specifications, and pricing of this watch, I’ve decided to give it a 8/10. I hope you enjoyed having a read through of this TW Steel CB216 review. As always let us know what you thought in the comments section below.